Theatre Review There's no sign of Captain Pugwash as I make my way through the streets of Greenwich to the National Maritime Museum, although I do surprisingly spot several swashbuckling Jack Sparrows. After some initial confusion as to why I'm not a child or don’t have a kid with me, I manage to convince those in charge that – since I have a mental age of six – I am suitable to review Punchdrunk’s new production, Against Captain’s Orders: A Journey into the Uncharted, from the intended audience’s point of view. 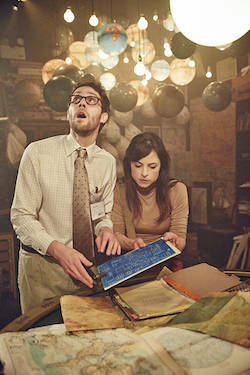 I’m a sucker for interactive theatrical experiences and Punchdrunk is renowned for putting on some of the most innovative performances around, such as controversially non-linear The Drowned Man. The National Maritime Museum now plays host to its latest promenade performance but you can only attend if you have managed to convince a child aged between six to 12 to come with you. On arrival, ticket holders for the timed performance including myself are handed life jackets with coloured patches. These denote which of the four nautical themed groups you have been assigned to. I end up in the navigation group, which is clearly a mistake given my over-reliance on my trusty satnav. Each group is given specific tasks throughout the performance, which usually involve investigating and retrieving items of the museum’s vast treasury of maritime artefacts. Entering the performance we are introduced to our guides, Arthur Ambrose, the suitably bespectacled museum curator and his spiffing sidekick, Glan, who’s job it is to educate us about the seafarers of the past – be they well-behaved or otherwise. After an incident involving those who should know better touching things they shouldn’t, the museum’s security systems go into meltdown and it’s a race against time through flag-filled corridors and all kinds of flotsam and jetsam to get things back on an even keel. Being led at breakneck pace through darkened corridors emblazoned with warnings of swashbuckling parrots seems to be too much for a couple of the younger members of the audience. One kid screams: “I’m soooo scared”, so make sure you ward off lily-livered land lubbers before entering. On the whole, the smaller people present seem rapt with the beautifully detailed sets decorated with a multitude of curios stacked endlessly in dimly lit rooms. Light and sound play a huge part of this production, so-much-so that I neglect sunny Greenwich Park just outside. I'm often left behind the pack as I linger in these richly-decorated, nautical treasure troves. Illuminated globes, unfurling maps and cabinets full of charts and catalogues are just a few of the beautiful items on show. These rooms have been decorated with a painstaking attention to detail and this helps immerse me in this educational endeavour. These high production standards ensure value for money and a family day out well spent. Against Captain’s Orders: A Journey into the Uncharted is on now at the National Maritime Museum in Greenwich, London. Dates: 28 March – 31 August 2015. Show times run from 10:00am daily. Visitor info: 020 8858 4422 / website. Admission: £19.75.